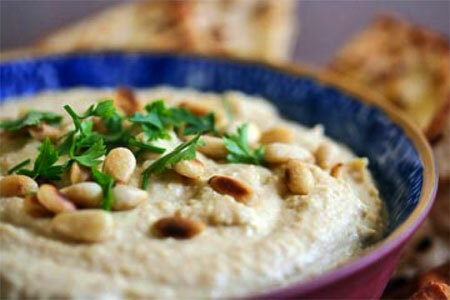 The word “hummus” means chickpea in Arabic. 1. If using dried chick peas be sure to drain the chickpeas and place in a pot of lightly salted water to cover by 2-inches. Bring the water to a boil over a high heat until it foams, about 5 to 10 minutes. Remove the foam with a skimmer and continue boiling, partially covered, until tender, about 3 hours, so keep checking. Add boiling water to the pot to keep the chickpeas continuously covered. Drain and save 1 1/2 cups of the cooking water. If you use the dried chick peas it is important to peel and discard the peel. Return the cooked chickpeas to the same pot filled with some cold water so you can rub the skins off the chickpeas with your fingers (many of them will rise to the surface. 2. Process the chick-peas with 1/2 cup of the olive oil and 1 cup of the reserved chickpea cooking water in a food processor until creamy. 3. In a mortar, pound the garlic with 1 tablespoon salt until it is a creamy mush. In a small bowl, beat the tahini and lemon juice together slowly. If it is too thick, add water-never more lemon juice. Stir the tahini and lemon juice mixture into the garlic and salt. Stir this mixture into the chickpea puree, adjust the salt, and season with pepper. Check the consistency; if it is too thick, like an oatmeal, then add some of the remaining reserved chick-pea cooking water until it is smoother, like a Cream of Wheat. Check the taste and adjust the seasoning if necessary. If you do need to adjust the taste, the process must be repeated-in other words, mash some more garlic with salt or mix a tablespoon of tahini with a tablespoon of lemon juice. 4. In a small skillet, cook the pine nuts in 1 tablespoon of the olive oil over medium heat until light brown, stirring, about 4 minutes. Remove and set aside. 5. Spoon the hummus onto a large round serving platter, not a bowl. Warm the remaining 3 tablespoons extra virgin olive oil. Make spiral or fan-shaped furrows in the hummus and fill with the warm olive oil. Sprinkle the reserved pine nuts around. Garnish the edges with mint leaves and sprinkle the chopped mint on top. Serve with warm Arabic flatbread or pita bread. Sfeeha is sometimes called “Palestinian pizza.” It is made to serve with a meal, or as an evening or mid-day snack. This recipe makes 5-6 dozen little sfeeha pizzas. Make the dough and prepare the topping while the dough is rising. For the dough, scald milk. Add oil/margarine, salt and sugar to the milk. Cool to lukewarm. Dissolve yeast into 1/4 cup water with 1 teaspoon sugar. Add to warm milk. Beat in 3 cups flour until smooth. Add 5 cups flour and knead for 5 minutes. Set the dough in a warm place and let rise for 1 hour (until the size doubles.) After kneading down the dough, pinch off small pieces of dough and flatten by hand into small 3-inch-diameter pizza shells. Press into each shell a teaspoon of topping mixture (below.) Let rise one more hour in a warm place. Then bake at 400° (F) for 10 minutes, or until dough is golden brown. Serve hot. Chop the tomatoes, onions and pepper very fine and mix with the raw ground beef. Salt and pepper to taste. Put the meat mixture into a colander or strainer and press as much liquid out of the mixture as possible. Place a teaspoon full of the mixture onto prepared individual pizzas and press into the dough. Note: To reduce cooking time, soak all dried beans and vegetables overnight in warm water. Brown 2 onions in 1/4 cup oil in a large pot. Add salt, pepper, turmeric. Drain and add all the presoaked vegetables. Pour in the water and broth. Bring to a boil. Reduce heat to medium. Cover and simmer for one hour. Stir occasionally. Add parsley, cilantro, green onion, spinach. Cover and cook one more hour. Brown garlic and mint in remaining 1/4 cup oil. Add to pot. Reduce heat to medium low, stirring occasionally until all the vegetables are fully cooked and soup is puréed. Strongly suggested with this recipe is using good feta cheese. Serve with fresh soft pita bread to dip in. With a fork, crush the feta cheese and mash with the lemon juice and the vegetable and olive oils until smooth. Harira is traditionally served each night of Ramadan to break the fast. Heat the olive oil in a medium stockpot or Dutch oven over medium-high heat. Season the chicken pieces with 1/4 teaspoon each of salt and pepper. Add the chicken in batches, and cook until well browned, about 4 minutes per batch. Remove the chicken from the pot and set aside. Add the onions and celery and cook until softened, about 4 minutes. Add the ginger, turmeric, pepper, cinnamon, and nutmeg and cook, stirring constantly, for 1 minute. Return the chicken to the pan and add the tomatoes and their juices, stirring well. Stir in the chicken stock, lentils, and chickpeas and bring to a boil. Reduce heat to medium-low, cover, and cook at a gentle simmer for 1 hour. These delicate cake- like cookies are a real treat any time of the year. Thanks to Ibtissam Erroutbi for this recipe. Combine coconut, flour, powdered sugar, lemon zest, eggs, oil and melted butter. Let ingredients cool for one hour. Then add baking powder and mix. Shape into small balls smaller than a golf ball: dust with powdered sugar place on baking sheet and flatten to form ghribas. Bake for 20 minutes. These traditional Moroccan cookies are one of my favorites because they’re not too sweet and go well with tea, coffee, or milk. Like the Italian biscotti, fekkas are baked twice. Anise seeds and orange flower water give fekkas a distinctive Moroccan flavor. Preheat your oven to 350° F. and lightly oil a baking sheet. Mix together 3 1/2 cups of flour with the sugar, salt, baking powder, sesame and anise seeds. Stir in the raisins and almonds. Add the eggs, oil, butter, orange flower water and vanilla and mix well to form a soft, slightly sticky dough. Add up to an additional 1/2 cup flour only if you need it to make the dough manageable. Divide the dough into large balls about the size of baseballs. On a lightly floured surface, roll the balls of dough back and forth to form smooth logs about the diameter of a banana. Place the logs about two inches apart on the greased baking sheet. Brush the logs with the egg wash, and pierce the logs with a fork in several places to let steam escape. Bake in the preheated oven for about 20 to 25 minutes, or until the logs barely begin to take on a pale golden color. Carefully transfer the logs to a rack to cool. Cover with a towel, and leave until the next day or at least 10 to 12 hours. Preheat your oven to 400° F. Cut the logs into 1/4 inch slices (a long serrated knife works best). Place the slices on an ungreased baking sheets, and bake in batches for 15 to 20 minutes, until medium golden brown. Remove the cookies to a rack to cool. Store fekkas in an airtight plastic container for up to a month. They will keep well in the freezer for several months. 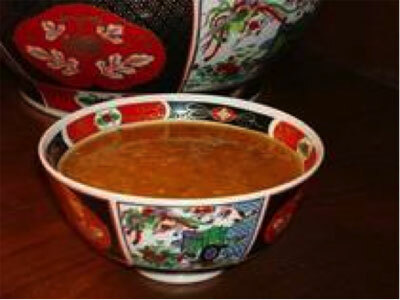 This is a wonderful and filling soup that can also be made without meat. It would also adapt to a crockpot. A brik is deep fried, olive oil is best, then drained on a paper towel. Here is a tasty version which takes only 15 minutes to make. The trick is to hold the triangular brik with the point up while biting into it and not let the egg run down your chin. Good luck! Roast the eggplant on a barbecue or flame until soft and tender. Alternately, place the whole eggplant in the oven for 30 minutes at 250° Farenheit, turning occasionally. Peel the eggplant and drop it in a food processor. Add the remaining ingredients and blend until mixture is smooth. Garnish with more parsley, tomato wedges and black olives. Wash and peel the cucumbers. Cut in half lengthwise, then chop in semicircles. Put the yogurt in a bowl and mix in the chopped cucumbers, salt and crushed garlic. Sprinkle the salad with dried mint and chill. Serves two to four people. Chop cucumbers, tomatoes and onion coarsely and mix together. Add lemon juice and olive oil and toss together. Toss in salt and pepper to taste. (Try the spice "tahbal" if available.) Chill several hours before eating for best blend of flavors. Wash cucumbers, peel and cut each one into small pieces as desired. Wash tomatoes, cut into small pieces. Wash the parsley and chop very fine. Combine the above in a bowl with the juice of one lemon. Add salt and pepper and mix well. Serves two to four people. Habeeb Salloum of Ontario, Canada presents the first contribution from Yemen, a country on the southern tip of the Arabian Peninsula formed in 1990 by the merger of Yemen Arab Republic (North Yemen) and People's Democratic Republic of Yemen, South Yemen. This dish is served as an appetizer; dip or side dish. It serves four. Roast eggplant in a 350° Farenheit oven for 1 hour. Remove and allow to cool. Peel and place in a food processor. Add onion, lemon juice, olive oil, garlic, salt, pepper and cumin. Process for about one minute. Place on a platter, then decorate with olives and tomato just before serving. A popular dish in this country, this version of "Tabuli" (Tab-bu-leh) makes four servings. Although united under the Ottoman Empire, the Arab countries were divided as a result of World War II. The divisions created borders which prevented the populations from interacting. Years of isolation and separation between the countries created variations in the cuisine. These variations are due to availability or lack of certain produce and spices. Wash the cracked wheat twice and drain well immediately. (If the cracked wheat soaks up too much moisture, the taste will be bland. If rinsed properly, the olive oil will soak into the wheat.) Mix in the chopped green onions, tomatoes, parsley, mint, pepper and allspice. Refrigerate for two hours. Just before serving, add olive oil, lemon juice and salt. Start with a little salt and lemon juice and add if need be. Cook peppers, pine nuts, and garlic in butter in large skillet over medium-high heat until light brown. 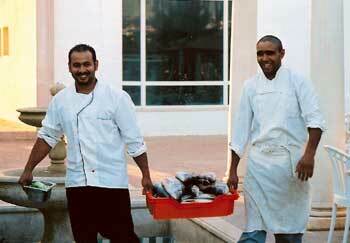 In Tunisia it is a tradition to welcome guests with couscous. This recipe is from the kitchen of Mourad Chaouch. Sauce: In a large frying pan, sauté diced onions with the meat (if any is used). Once the onions are transparent, slowly add the tomato paste, mixing it frequentIy. When the paste is well mixed (a few minutes), pour in 1/2 cup water with spices and let simmer at about 200° Farenheit for 10 minutes. Put in all the rest of the chopped vegetables and cover with 2 cups of water. Let cook for 30-35 minutes or until meat is tender. If no meat is used, cook until potatoes are tender. Couscous: If a box couscous is used, follow directions on box. If bulk couscous, use a large fry pan. Heat 1/2 cup water and 1 stick (1/4 pound) margarine. When it starts boiling, put in the couscous grains slowly and mix frequently. Once all couscous is wet, pour in 1 1/2 cups of water until barely covered. Let simmer at 200° Farenheit until the couscous is dry. Mix well and let simmer a few minutes more. Serving: Slowly pour the sauce on the couscous, keeping the vegetables in a separate dish until enough sauce has been used on the couscous. Serve the vegetables on top of the couscous. Serves four Tunisians or eight Americans. This Palestinian recipe comes from Haifa Siam of Chicago. Haifa points out that the result feeds a large group and is traditionally served at family gatherings, Fridays (Muslims' day of worship) and feasts. During preparation, Haifa advises to keep in mind, "There is an Arab saying: "Your eye is your scale." Cut meat or tofu to desired sizes, wash and spice. Fry finely chopped onion in a small amount of oil, then add slices of meat/tofu and let steam for 5 minutes. Add water and let boil until tender (well cooked). Cut vegetables. If you are using eggplant, put some salt on them and leave in water for a while so that it won't absorb oil after frying. Fry vegetables in oil, then drain on paper. Fry tomato, then garlic. Put pieces of meat/tofu in deep pot, then tomato, garlic and vegetables so that they surround the meat/tofu. Mix rice with some spice, salt and chickpeas; then add to the pot. Add water to cover rice (it should be about 1/2 inch above rice level). Let boil, then lower heat to simmer and leave until rice is well-cooked and fluffy. Lebanon, Palestine and Syria, like most of the Arab League countries, are located at the crossroads between the West and the East. For thousands of years the area of the Middle East has been occupied by many different leaders from the early Greeks to, more recently, the French. Influenced by the different civilizations, the cuisine in the Middle East developed into one which is fascinating, diverse and, most important, delicious. I lived in the Middle East from 1963 (when I was born) to 1981, a relatively quiet time for the evolution of the cuisine. During that time, I learned from watching my family prepare traditional meals which were taught to my mother and father by their mothers and fathers. The most valuable lesson I learned was that all ingredients are prepared from scratch. There is no easy way out and no short cuts. This fact makes the preparation of our food time consuming, but well worth the wait. Our family moved to the states in 1981. My mother still believes in making things from scratch, but for me things have changed. Long hours at work, many hobbies and other commitments challenged me to find short cuts in making the food I grew up with yet does not sacrifice the superb taste. The following is a recipe for homemade spinach pie. The estimated time of preparation is 30 minutes. 1 tube of biscuit dough (non-buttered kind), with 10 biscuits. Mix spinach, onions, walnuts, lemon juice, vegetable oil, salt and pepper to make the stuffing. Biscuit dough must be flattened and rolled into a 4 1/2 inch circle. Place on full tablespoon of stuffing in the center of the circle and fold as shown. Bake at 375° Farenheit for 20 minutes or until golden. Serve hot or cold with a side of plain yogurt. Chef Sabi Atteyih offers this alternative to a traditional spinach pie. Most is made with phyllo dough, which is thinner and more time-consuming to make. Heat 1/4 cup of butter in the oil. When melted, remove from the heat and set aside. Use an electric mixer to beat the eggs until soft and fluffy. Add the butter-oil mixture and beat a few seconds longer. Using the spatula, fold in the semolina flour, baking powder, salt, and vanilla. Blend well. Preheat over to 350° Farenheit. Prepare the baking sheets by smearing with dabs of sweet butter. Place the remaining 1/3 cup confectioners' sugar in a flat dish. Form the cookies by pinching off walnut-sized balls of dough and rolling between your palms until a perfect sphere is formed. (Dough is very sticky, so it's good to moisten your hands from time to time.) Flatten the sphere slightly, dip one side into powdered sugar and arrange on a buttered baking sheet. Bake on the middle shelf of the preheated oven for 15-18 minutes. When they are done, the cookies will have expanded and crisscross breaks will appear on their tops. Allow to cool and crisp before storing. Note: They will keep at least a month in an airtight tin container. This recipe comes from the Winter '97 issue of Saudi Arabia which is published by the Information Office of the Royal Embassy of Saudi Arabia. Blanch, peel and fry the almonds in oil until golden brown, place on paper towels to drain. In a pan, melt the butter, add pitted dates and stir well over low heat; dates should not stick to the sides of the pan. Remove from stove top. Add the cardamom and leave out to cool. Take a small piece of date dough, place an almond in the center and roll into a finger shape. Repeat using all the date dough. Roll each date finger in the coconut and arrange on a serving dish. Serves eight to ten.